As fans well know by now, the plot of 2015’s Star Wars: The Force Awakens largely revolves around the absence of Jedi knight Luke Skywalker (Mark Hamill). A map supposedly leading to Skywalker’s current, remote whereabouts is the film’s main MacGuffin, and the iconic opening crawl begins with the words “Luke Skywalker has vanished.” Luke has gone into self-imposed exile after basically negating everything he spent three whole movies accomplishing. The galaxy is in pretty much the same state it was at the start of A New Hope, and the lives of Han and Leia are immeasurably worse thanks to his meddling. 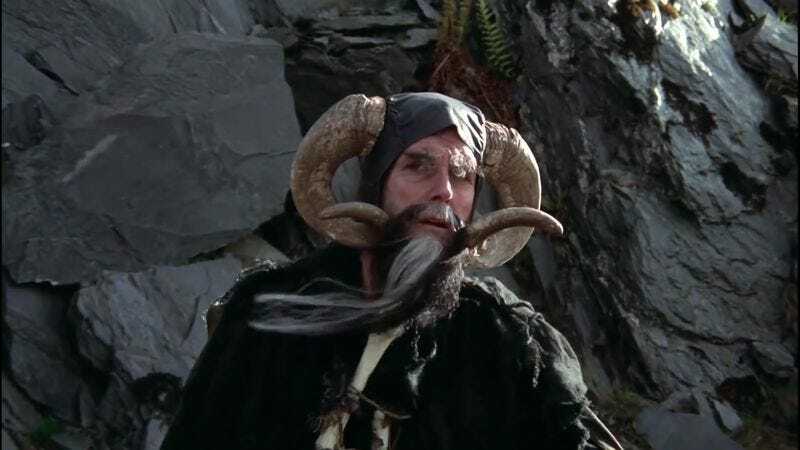 In this iteration, thanks to some clever editing, Rey actually stumbles upon Tim The Enchanter, one of John Cleese’s loony characters from 1975’s Monty Python And The Holy Grail. The substitution makes a little sense, because Tim and Luke have a few important things in common. They’re both grouchy, bearded hermits with incredible and dangerous powers. The difference is, Tim isn’t shy about showing his powers off. Before he actually appears onscreen in this mashup, he announces his presence by causing several fearsome explosions. Rey is obviously taken aback, but she bravely/foolishly approaches him anyway. The funniest moment is when Rey almost offers Tim a lightsaber but then thinks better of it. If there’s one thing this guy doesn’t need, it’s another dangerous weapon. That flamethrower staff of his looks pretty badass as it is.